It's still pretty early in the morning (early in my terms) where the mall had just opened for business and the crowds weren't there yet but later on when the event went live, crowds gathered to view what was going on. All nicely prepared for me with ice cream containing chocolate and vanilla flavor, some sprinkles of nuts and a drizzle of chocolate syrup with two wafers stuck at one side as I await for the introduction from the emcee. The event was graced by Dato' Chef Fazley, Astro Ria's Masterchef Celebrity Malaysia Champion where he's also a trained and certified Pattiserie Chef of Le Cordon Bleu Paris. 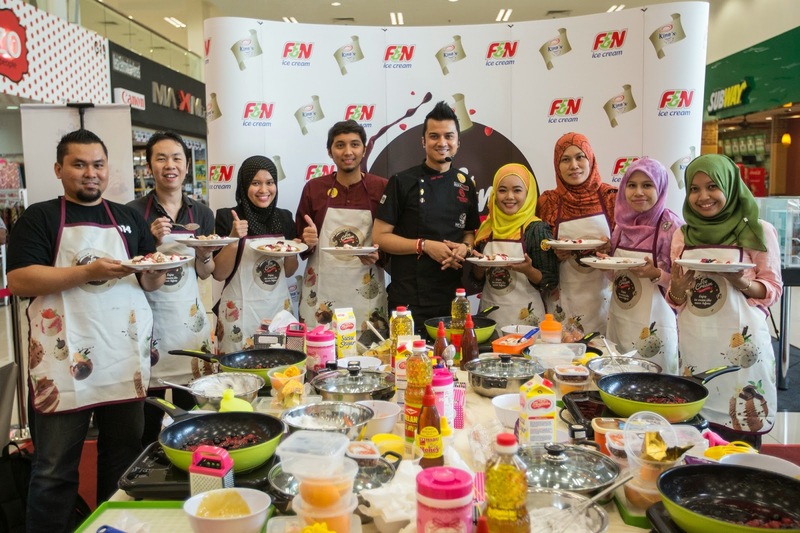 Dato' Chef Fazley who was recently appointed as King's brand ambassador conducted dessert making workshops that day which I participated in one of 'em and will be conducting many more during the ongoing of the campaign. He also spoke about interesting and easy ways of preparing desserts. 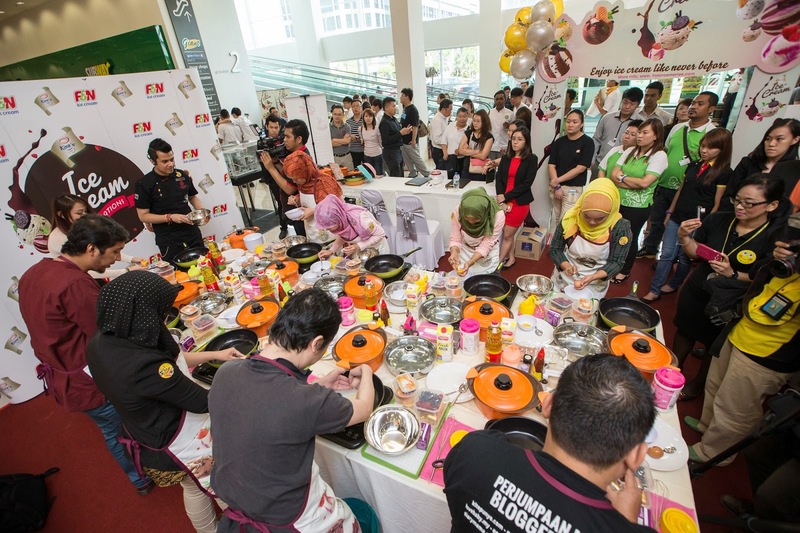 King's 1.2L Ice Cream Inspirations Contest were also emphasized by the General Manager of F&N Creameries (M) Sdn Bhd whereby participants stand a chance to win a one-year supply of King's ice cream should their recipe get picked out as one of the inspirational entries. 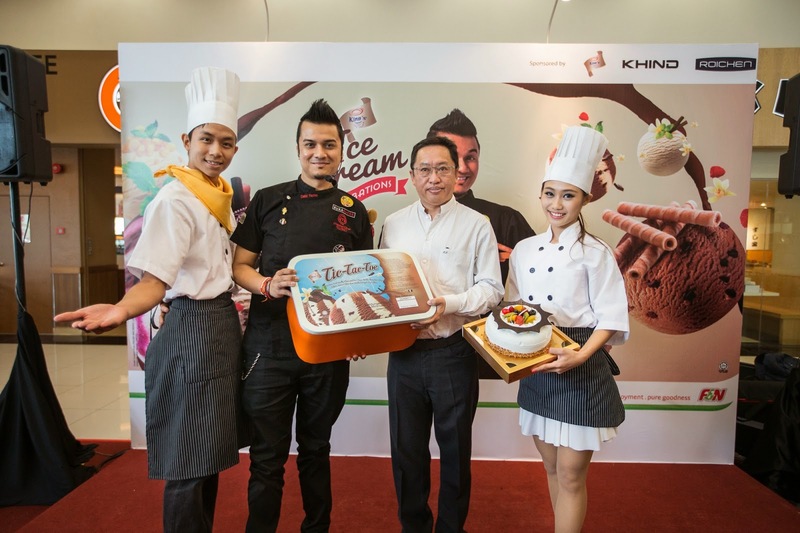 If you're interested in participating, all you need to do is visit King's website at www.fnncreameries.com (Malaysia) and upload photos of your creation and submit the creative recipe that uses King's ice cream. You may submit as many different recipes as you want before 30th September 2014. The mission is to make a French dessert called Ile Flottante (Floating Island in English) which is Poached Meringue over Cream Sauce where in our case, some King's Ice Cream will be added into the mix. Where from the picture above, you see me observing how the Chef does it. (Picture courtesy of www.thestar.com.my website) Whipping up the meringue is super duper hard work. You have to use strength and to whip it till it all sticks together. Mine looks a mess but darn it taste good. The ingredients certainly worked well together. Don't ask me for the recipe because I can't remember it. Haha. But I believe it's in the F&N's website. So yesterday, I had a tub of King's 1.2L Tic-Tac-Toe flavor arrived at the office to try. Kind of swirly shaped almost like an S. LOL. Probably had melted a bit in the car. Basically, Tic-Tac-Toe is Chocolate and Vanilla Flavored Ice Cream with Chocolate Chips. Generally, I quite like it. It's tastier than how other normal ice cream tastes. Those that I shared with had okay and positive feedback. It's creamy no doubt but has a milky taste to it. One said not enough chocolate chip spread about which I do agree. King's 1.2L ice cream is available at all leading hypermarkets and supermarkets nationwide at RM7.20 per tub. There are currently nine flavors to choose from, Chocolate, Vanilla, Choc o' Chips, Chocolate Chip, Sweetcorn, Raspberry Ripple, Cookies n' Cream and their 2 new variants Carnival (Neapolitan with thin stripes of vanilla, chocolate and strawberry) and my favorite among them all, Tic-Tac-Toe.